Have you ever wondered exactly how easy it is to install an Arbrux floating pond fountain? In our Shop Talk video series, I’ll show you first hand how easy and quick it really is. In the video, we’ll unbox and assemble a ½ hp floating fountain, in just a few simple steps, and in real time! But don’t take our word for it, see for yourself! Arbrux floating pond fountains are used in a variety of applications, from golf courses and large estates, to small communities, and more! 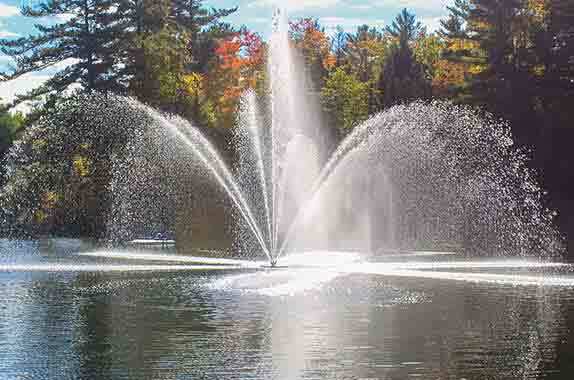 A pond fountain creates a beautiful focal point for your guests and patrons to enjoy. We only use durable components like stainless steel submersible motors, impeller pumps, and quality heavy duty Poly shell floats with a closed cell foam filled core. As the manufacturer, we believe in designing products that are easy to install and easy to use. So you can enjoy your pond fountain for years to come. And with the addition of our lighting kits, you can enjoy your water feature into the evening. Light up your fountain and create the perfect backdrop for parties, wedding photos, family gatherings, and other events. Lighting kits are now available with LED’s for improved energy efficiency and longer lifespan.